Context. Through in-depth consultations, the Government of Tanzania finalized in June 2005 its second poverty reduction strategy called the “National Strategy for Growth and Reduction of Poverty”, or MKUKUTA, covering 2005-2010. The strategy identifies three clusters of broad outcomes: growth of the economy and reduction of income poverty; improvement of quality of life and social well-being; and governance and accountability. The MKUKUTA aspires to a high degree of cluster and cross-sectoral coherence across a very broad policy range. Government has embarked on an ambitious program for MKUKTA implementation, attempting a comprehensive and innovative approach on linking MKUKUTA to planning, budget and monitoring systems. World Bank Group Program. Over the past several years, the World Bank Group has been actively engaged across a wide range of sectors and thematic areas in Tanzania. Given this level of engagement, significant lessons have been learned which offer a solid platform for the WBG’s strategic approach in Tanzania during the FY07-10 period, including: 1) a focus on results is critical to achieving the desired outcomes and usually requires a multi-sectoral approach; 2) partnerships, including harmonized aid modalities and an increasing move to budget support, are important for making the best use of resources and comparative advantages, reducing transaction costs for government, and building the capacity to deliver results, and 3) analytics and advice (AAA) are key to providing a solid foundation for informed policy decisions and investments. WBG’s engagement is based on: (i) Government expectations; (ii) IDA’s broad mandate and technical capacity within the country office which enables active IDA participation in government-led working groups at both the program and sector levels, and facilitates access to the WBG’s global reach and technical depth; and (iii) the relative mandates and capacity of other DPs. By maintaining a broad engagement across sectors, the WBG is well placed to support Government as it implements one of the largest and most complex programs in Africa, experimenting with new approaches on results, alignment and harmonization untested elsewhere. In support of MUKUTA Cluster I: Growth of the Economy and Reduction of Income Poverty, the WBG will strive to further improve prospects for growth, especially improvement of the investment climate, through better informed choices and better financed programs in agriculture, forestry, environment, and mining; reduced infrastructure bottlenecks, notably in transport and energy; a stronger focus on improving labour force skills; deepening reforms in the financial sector and enabling environment for private sector activities; and increased regional integration. In MKUKUTA Cluster II: Improvement of Quality of Life and Social Well-being, the WBG’s strategic focus will be to strengthen health financing and human resources, and technical, tertiary and secondary education, improve capacity at local government level to deliver services, together with improved monitoring and reporting; and support social protection with a focus on analysis and advice on how to better manage social risk and reach the vulnerable members of the community. In MKUKUTA Cluster III: Governance and Accountability, the WBG strategy will help improve governance at national, district and village levels, through both supply- and demand-side assistance; and promote greater use of country systems, and more effective use and strengthening of domestic capacity and accountability, notably in key governance institutions, e.g. accounting, auditing, financial management, procurement, and social safeguards. The Bank is aligning behind Government’s programs and strategies, increasingly using harmonized aid modalities, such as development policy lending, basket funds, and joint analytical and advisory services, and relying more and more on Government processes and systems. This approach reduces Government’s transaction costs and increases aid effectiveness by strengthening Government’s systems, including sector review processes, financial management, accounting, auditing, procurement and M&E. In addition, it encourages greater attention to cross-sector linkages. Ensuring strong WBG expertise in-country for key sector and cross sector work is critical to sustaining the policy dialogue, supporting program implementation, and contributing to improved outcomes. Part I is the national medium-term framework established by Government for managing development co-operation with its Development Partners (DPs) so as to improve the collaboration in achieving national development and poverty reduction goals. In discussion of the draft JAST, Government and DPs agreed on the need for further joint work on parts II-IV below, engaging the entire DP community and focusing on the Government’s own planning process, the MTEF in particular. The appropriate balance of roles between Government and DPs in the JAST and wider planning process has been a fruitful area of dialogue, under continuing review through the Government-led JAST Working Group. Part II and Part III are the Joint Program Document (JPD) developed in consultation with Government by the Development Partners Group (DPG) as a response to Tanzania poverty reduction strategies (MKUKUTA for mainland Tanzania; MKUZA for Zanzibar) and the JAST. 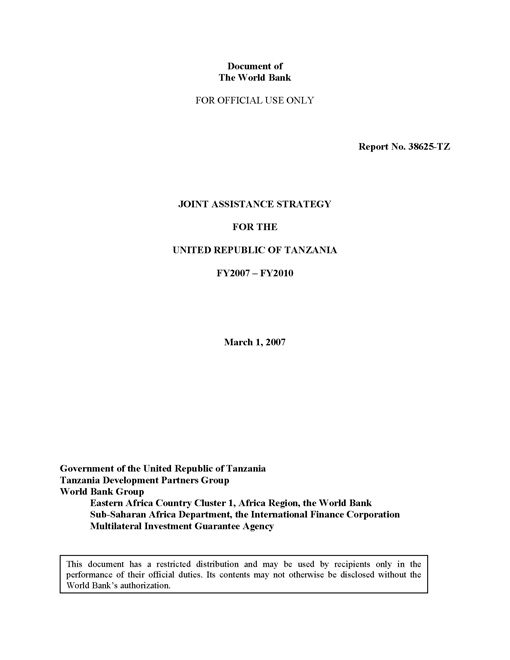 Part II is a joint country analysis describing Tanzania’s development achievements and challenges. Part III is the joint program part, reflecting DPG planned support and aid effectiveness commitments to Tanzania over the 4 remaining years of MKUKUTA, FY07-10. Part IVs are agency specific supplements, building from the analysis, commitments and undertakings in parts I, II and III. The World Bank Group (WBG) Part IV describes the WBG’s strategic approach and proposed program over support over the FY07-10 period (advice, analytic work and financing, both ongoing and planned). Based on the Results Matrix for all DPs in Part III, Part IV also includes a WBG specific results matrix with milestones that facilitate monitoring of progress during the FY07-10 period.